The stepped cross is made up of an equal-armed cross indicating the cardinal points of the compass and a superimposed square. The square represents the other two levels of existence. The three levels of existence are Hana Pacha (the upper world inhabited by the superior gods), Kay Pacha, (the world of our everyday existence) and Ucu or Urin Pacha (the underworld inhabited by spirits of the dead, the ancestors, their overlords and various deities having close contact to the Earth plane). 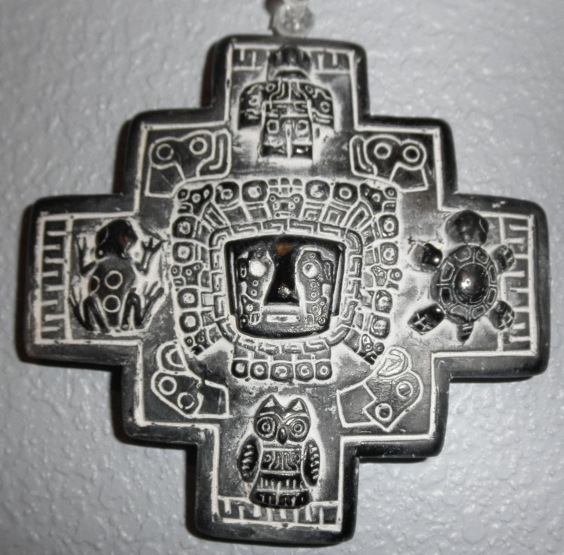 The hole through the center of the cross is the Axis by means of which the shaman transits the cosmic vault to the other levels. The cross has 12 points and legend has it that these points represent the following sayings, affirmations and life points: I live, I work, I love, The underworld, The current world, The upper world, The cougar, The Eagle, The snake, Don’t Lie, Don’t Cheat, Don’t Steal. North is air, south is water, east is fire and west is earth. The top arm is held in the East with the fire. The centre is the 5th element, the force of love emanating from the void. The three rectangles could represent the physical world, the ether world, and the astral world, with each side representing one of the four elements in each world. and the higher world Hanan Pacha with the condor as symbol, the Cardinal modality of astrology, Rajas of the Gunas. These three animals Snake, Puma and Condor are equivalent to Ox, Lion and Eagle as we know from the European and Asian continent. I have written more about these relations in Serpents of the Kundalini Fire, especially in connection to the Gunas, the Chakras, and the Kaballah Tree of Life. The top section is the Hanag Pacha which is the upper world (super conscious) and the animal symbol for the upper world is the condor. It holds, within the steps, the principles of the tradition. They are Yachay, Llankay and Munay. Various beings mentioned in mythologies come under this heading, such as the Greek harpies and Erinyes, the Hindu Rakshasas, the Arabic djinns, the Germanic elves and Valkyries, etc. In Aztec mythology, Cihuacoatl (”snake woman”; also Cihuacóatl, Chihucoatl, Ciucoatl) was a motherhood and fertility goddess, haunting crossroads at night to take children. She also helped Quetzalcoatl create humanity by grinding the bones of our ancestors and mixing the result with Quetzalcoatl’s blood to form the clay from which humanity were molded. Here the soul (Quetzalcoatl’s blood) is born into the physical (the bones), giving the body of man (the clay) with the Ego. The Naga Kanya (Cobra Women) are a race of fairy-like demigods born of the Nāga, which are water deities. They have the form of beautiful maidens, but usually maidens only from the waist up, while from the waist down they are serpents. The Japanese have Nure-onna (“wet woman”), here in an illustration from the Edo Period, by Sawaki Suushi. The Greeks revered in the Mysteries other Gods as well as the celestial Gods, namely, the Chthonic Gods. And of one who was initiated in the Mysteries one could say with truth: he learns to know the upper and the lower Gods, the Upper and the Lower Gods. The upper Gods were those of the Zeus-circle; but they only have rulership over what is spread out before the senses, and what the intellect can understand. The human being is more than this. Man is rooted with his being in the kingdom of the lower Gods, in the kingdom of the Chthonic Gods. This Chthonic world consists of twelve elemental groups of beings, which are the real foundation of the visible physical world, and all kinds of magical systems around the Earth try to influence the physical world through these beings. Don Juan talk about the flyers, inorganic beings, in Castanedas books, the Gnostics talk about the Archons, alien predators, the wise Greek healer Daskalos talks bout the Elementals, and Jung talks about the Shadow. See “Gnostic Parallels in the Writings of Carlos Castaneda” which are good and the best contribution on that web-address. I have collected some texts on Elementals building on the Christian view of Daskalos here. In most remarkable words, Pherecydes spoke of the holy primordial triad, of Zeus, Kronos and Chthon, principles fundamental to the earth, having come over from pre-terrestrial ages; he also speaks of a further evolution. But in ancient times men did not clothe matters of this kind in such dry, crude concepts as they do today, they drew vivid pictures of what they saw and recognised in spiritual realms. Pherecydes said: ‘Chthon becomes Gea (today called earth), because of the gift of Zeus whereby she came to be covered as with a garment.’ This is a wonderful description of that evolution which I have just outlined in a few short words. The earth was alone; outside it were the sun and the moon, the spiritual kingdoms of Zeus and of Kronos. The sun from without began to work upon the earth and to fructify it in its then chaotic state; or, in the language of the old Greek sage, Zeus fructified Chthon. The beneficent influences of the kingdom of Zeus were sent down to the physical earth in the warmth and light of the sun. This was the gift made by Zeus to the earth. The earth covered herself with the garment of plant and animal forms, and with the forms of physical men. Chthon becomes Gea; therefore, because of the gift of Zeus the earth covers herself with a garment. The four elements of astrology (fire, earth, air, and water) are the basic building blocks of all material structures and organic wholes. Each element represents a basic kind of energy and consciousness that operates within each of us. Just as modern physics has shown that energy is matter, these four elements interweave and combine to form all matter. When the spark of life leaves a human body at death, the four elements all dissociate and return to their primal state. It is only life itself, manifesting in an organized, living whole, that holds together the four elements. All four are in every person, although each person is consciously more attuned to some types of energy than others. Each of the four elements manifests in three vibrational modalities: cardinal, fixed, and mutable. Hence, when we combine the four elements with the three modalities, we have twelve primary patterns of energy which are called the zodiacal signs. The head is the Luciferic and the tail is the Ahrimanic, where Rahu relates to Dharma, and Ketu to Karma. I look at the snake in European mythology in The Snake and the Heel in Mythos which build on Steiner’s lectures. Andean Mysticism and Healing the Plane(pdf) by Oakley E. Gordon, Ph.D.